At Two Sapphires, we specialize in creating classic, elegant portraits and capturing timeless candid moments. We are a boutique photography studio in San Antonio but we travel to clients in Houston, Dallas, Austin, and the hill-country so often that we don’t charge travel fees for portrait or event photography in these locations. We are also hired to photograph destination weddings and portraits outside of Texas - Manhattan, Jersey, Los Angeles, Malibu, and New Orleans to name a few… Our ideal clients are educated, well-traveled professionals with an appreciation for the arts, an eye for quality, and they see the inherent value of the printed image. When you work with Two Sapphires, you get a creative husband and wife team that will help you from the planning stages (location selection, styling, logistics) all the way through to print selection and image placement on your walls. Another unique perk is that we include professional hair and makeup in-house with all portrait sessions. No matter what you need photographed, there’s a good chance we do it very well: wedding photography, corporate event photography, bar mitzvah / bat mitzvah photography, family photography, lifestyle photography, actor / model / corporate headshot photography, glamour photography, boudoir photography, travel photography, product photography. Marci and I would love to hear from you - let’s make some amazing images together! Marci Madla and Kurtis Kronk became friends in 2015 after being introduced by a mutual photographer friend. They joined forces in December of 2016 with a shared studio space in downtown San Antonio and began dating in January of 2017. Within a matter of weeks, they were inseparable. Just one year after getting a studio together, Kurtis took Marci on what would be a life-changing trip; dining at the Michelin-rated Alinea Restaurant in Chicago, a "Top 5" on her bucket-list. 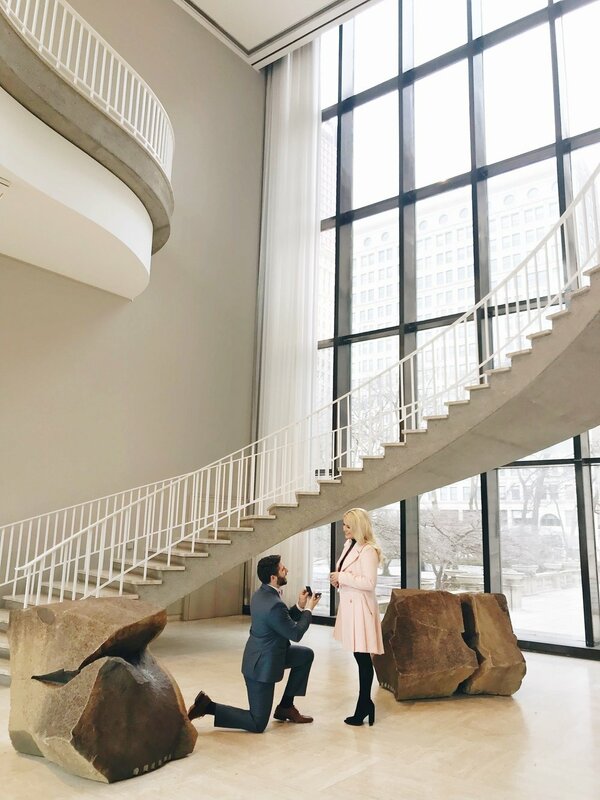 It was on this special trip that Kurtis asked Marci to spend the rest of her life with him (spoiler alert: she said YES!)... which brings us to [drumroll...] the ring! Kurtis, with the help of her Aunt (who happens to be a fabulous custom jeweler), designed Marci's ring to include a personal romantic reference to some of their favorite relationship traits. To accomplish this, he had "Aunt Hopie" place two hidden sapphires underneath the diamond. They are both Virgos, September babies born just ten days apart in 1984, and the sapphire is their birthstone. Since the moment they started working together, everything just clicked, falling effortlessly into place. As of September 2018, Marci and Kurtis have fully merged their respective businesses and adopted the name "Two Sapphires." Our time is the most precious resource we can give to anyone. It is the time spent and memories made together that we think about when we lose a loved one, and that is why we have chosen a career as photographers. The tremendous power of the photograph is its ability to transport us back in time to a memory and suddenly be moved to laughter or, in some cases, tears. It is that sense of emotion and nostalgia we wish to evoke in the images we create with our clients. Our goal is to capture authentic moments - beautifully; to produce timeless and elegant portraits, the type that will adorn your walls and those you one day leave behind. You'll get beautiful fine-art prints for your walls and stunning heirloom albums to pass on to future generations. What is it like to work with us? We take our craft very seriously, but we believe in being light-hearted and finding the humor in life. We're all fun and outgoing, but we also know how to take charge and command a room when it's necessary. We believe in being as prepared as possible going into any assignment, and then rolling with the punches when things inevitably change. Because it takes a village to transcend the ordinary. A full-time photographer since 2008, Kurtis has photographed over 200 events spanning over 10 cities from the West coast to the East coast. In addition to events and portraits, he photographs commercial assignments and panoramic landscapes. He loves adventuring, whether skiing, whitewater rafting, camping, or good old-fashioned 12 mile hikes up and down a mountain. An incredibly talented photographer, Marci's journey began as a professional hair and makeup artist working alongside award-winning photographers. Marci's hair and makeup services are included with most portrait sessions, and her expertise in color theory and styling is an asset in the planning stages of our sessions. Marci has a deep appreciation for great food, fashion, and a girl's best friend: wine (also: puppies). Amanda's first love is travel, and she is constantly ping-ponging back and forth from Austin to New Orleans. Her favorite weddings to capture are intimate affairs including only those nearest and dearest, to celebrate your love under the stars. When David isn't busy flying to Mexico and random countries throughout South America photographing famous musicians, he can often be found making portraits with high school seniors and models with his trusty old Hasselblad film camera. The man that makes it all possible, the wizard behind the curtain... Justin takes all of our event images, smashes the keyboard and mouse for unspeakable hours while sipping some local coffee (or whiskey), and makes them really shine. Basically, Justin is a saint.